많은 필리핀 사람들의 관심을 갖게 한 필리핀 예산안 심의가 지난달 29일 필리핀 상원의원회관에서 있었다. 에너지 관련으로 JV(Joseph Victor G. Ejercito) 상원의원을 만나 간략히 대화를 나누었다. 2층 대회의실에서 치열한 공방을 거치는 예산안 심의과정을 지켜보았다. 전에 만났던 마니 파퀴아오 상원의원의 모습도 보여 오늘 개인적인 만남을 위해 기도했다. 우리가 하나님께 기도한 것은 때가 되면 반드시 들어 주신다. 2년 전 마니 파큐아오의 고향 필리핀 Gen San(General santos)에 가서 그를 만났다. 얼마나 보안이 철저하고 어찌나 텃세가 심하던지 큰 상처가 되었다. 그와 사진 한 번 찍으려고 앙겔레스에서 마닐라공항을 거쳐 Gen San 공항으로 많은 돈을 들여가며 고생 고생해가면서 장거리 여행을 해야 했다. 다행히 내가 동시통역을 해주었고 독지가의 선처로 비용부담은 없었지만 통제가 심했다. 마니 파퀴아오와 찍은 사진조차 사용 못하게 하는 서러움도 있었다. 따분빈민촌 아이들에게 큰 희망을 안겨주고 싶었는데 참 아쉬웠다. 하나님 보시옵소서. 이 서러움을 언젠가는 내가 직접 주선해서 만나리라. 오늘은 주님의 은혜로 그를 만나 그의 친필 사인을 노트에 받았다. 사진도 마니 파퀴아오와 단둘이서 많은 사람들의 부러움을 사며 함께 사진을 찍었다. 앙겔레스 따분빈민촌 사역을 함께 동역하는 방안도 협의키로 했다. 하나님께 눈물로 기도한 것들은 하나도 땅에 떨어지지 않고 열매를 맺는다. 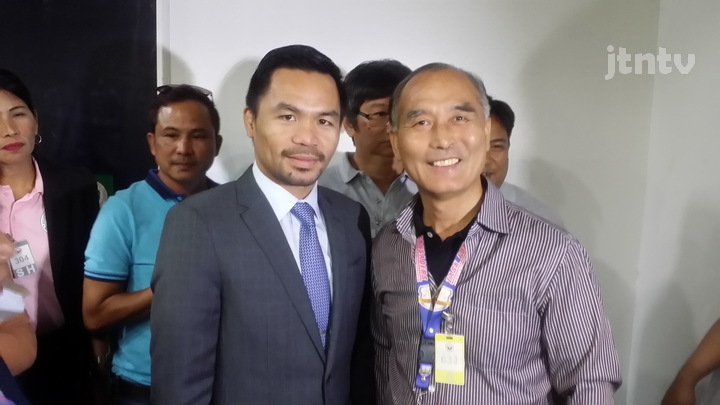 World boxing champion Manny Pacquiao met with Missionary Rev. Kyung Chul Lee( Rev. Charles Lee) at Tabun Poverty area in Angeles City Reunion with World Boxing Champion & the Senator of Philippines, Sen. Manny Pacquiao as the cause of the Philippine Senate into the history of God. The Philippine budget review, which has attracted the attention of many Filipinos, was held in the Senate House of the Philippines on November 29th. 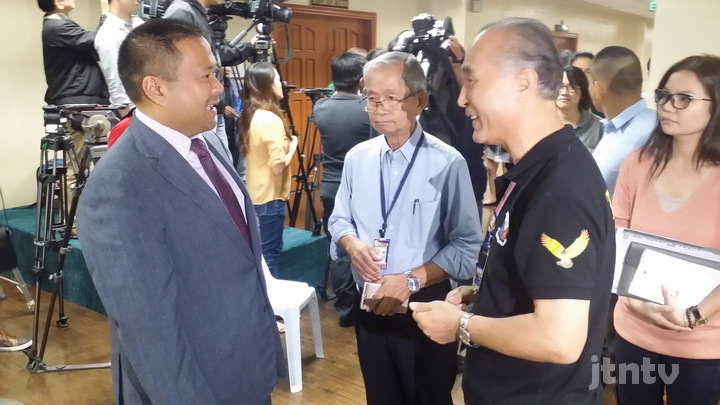 I met with Sen. JV(Joseph Victor G. Ejercito) for Energy fields and discuss in briefly. I watched the process of reviewing the budget through the intense workshop in the conference room on the second floor. Senator Manny Pacquiao, who I met before, also showed up and prayed for personal meetings today. It is inevitable that we pray to God in due time. Two years ago, I met him at Gen San(General Santos) in the hometown of Manny Pacquiao. I was hurt by how thorough the security was and how terrible it was. From the Angeles to Manila to take a photo with him I had to travel a long distance while suffering a lot of money. Fortunately, I did not have to pay for travel expenses because the simultaneous interpretation and sponsor, but it was difficult to control. There was a sadness that would not allow me to use the photographs taken with Manny Pacquiao. I felt sorry that I wanted to bring great hope to the children of the poverty. May God see this sorrow someday I will arrange it myself. Today I met him with the grace of the Lord and received his autograph in my notebook. The photograph was taken with Manny Pacquiao alone in the envy of many people. We also agreed to discuss ways to cooperate with the Angeles Tabun Poverty Ministry. Those who pray with tears to God do not fall on the earth but bear fruit. The encounter with Manny Pacquiao, World Boxing Champion & the Senator of Philippines, is not a coincidence but a work of the Lord. Reunion with Manny Pacquiao, who converted from Catholicism to Christianity, it is difficult if I do it, but it is easy for the Lord to do. This time also brings Glory and Praise to God who listens to our prayers. Shalom. 북 김영철 방남 접한 천안함 유족, “이게 나라냐?” 강력한 분노 표출. 복음전도자 빌리그래함 목사, 향년 99세에 잠들다! 기무사, 일선 부대장 군무원 임명. 문(文)발, 국방개혁? 개악? 북한 금강산 남북 문화 공연 일방 취소 통보. 또 늦은 시간에?